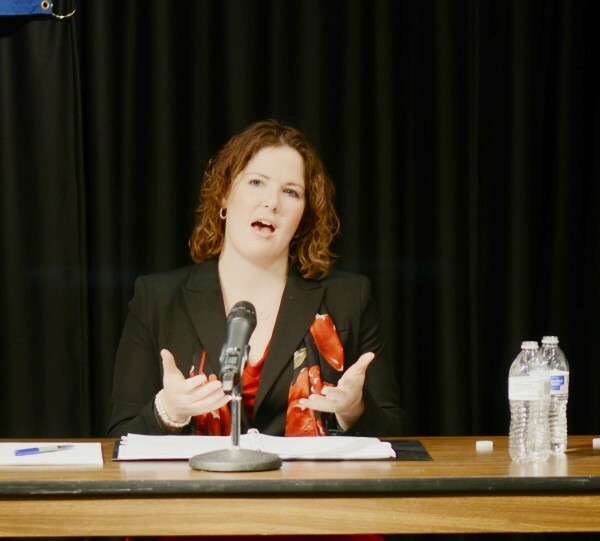 State Sen. Emily Cain, D-Orono, speaks during a forum with state Sen. Troy Jackson, D-Allagash, at USM's Lewiston-Auburn College on Thursday. The two are in a primary race to be their party's candidate to replace Maine's 2nd District U.S. Rep. Mike Michaud in the fall election. Cain and Jackson will square off in a June primary. Maine state Sen. Troy Jackson, D-Allagash, gestures during a forum at the University of Southern Maine, Lewiston-Auburn College on Thursday night. Jackson is in a primary race against state Sen. Emily Cain, D-Orono. The two state lawmakers are vying to be their party's candidate in the race for Maine's 2nd District congressional seat, which is vacant this year, as incumbent Mike Michaud runs for governor. 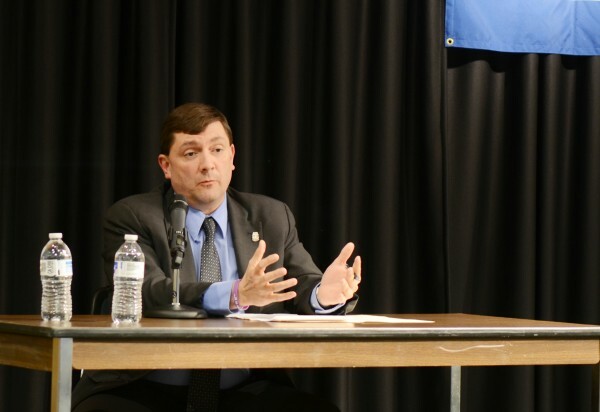 LEWISTON, Maine — Democrats vying to be their party’s candidate in the race to replace U.S. Rep. Mike Michaud in Maine’s 2nd Congressional District discussed a range of issues Thursday during a forum at the University of Southern Maine’s Lewiston-Auburn College. State Sens. Emily Cain, D-Orono, and Troy Jackson, D-Allagash, seemed to agree more than they disagreed on everything from renewable energy to unwarranted surveillance by the U.S. government. Both said the federal government must do more to reduce the mounting debt facing American college graduates and both said they would oppose any effort to pursue offshore oil-drilling in Maine. The biggest differences for those in the audience, largely faithful Democrats, seemed to be how each candidate came across. Cain seemed precise and detailed in her responses while Jackson drew on his personal experiences and connections to the working class. Others said they valued Cain’s record in Augusta and her ability to find solutions, broker deals and bring Republicans and Democrats together. Both lawmakers said they believed access to quality health care is a basic human right. They said that if they made it to Congress, they would carry on Michaud’s long-standing efforts to help Maine veterans. Both also said they would work to protect and enhance Social Security. In his closing remarks, Jackson, a logger, said he would never negotiate on “core issues” including universal access to health care, protecting Social Security and protecting the right of workers to organize for better wages and working conditions. Cain said she, too, has been a strong ally of organized labor and has voted to increase the minimum wage four times during her 10-year tenure in the state Legislature. Cain also noted that she supported abortion rights. Lewiston resident and voter Susan Charle said on most of the key issues, Cain and Jackson held very similar positions, and the thing that was most clear to her was that Democrats were going to have a tough decision to make in June. Meanwhile, Maine Democrats also celebrated the opening of their 2014 Androscoggin County campaign offices on Lisbon Street with visits from Michaud and their U.S. Senate candidate Shenna Bellows.